^ Chronologie 1890–1913. 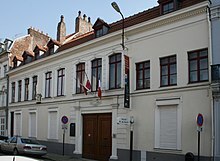 Fondation Charles de Gaulle. （原始内容存档于2013-09-03） （法语）. ^ La Genèse 1890–1940. Fondation Charles de Gaulle. （原始内容存档于2013-09-27）. ^ 4.0 4.1 1890-1914年：接受传统教育. 戴高乐基金会. [2013-10-14]. （原始内容存档于2013-06-21）. ^ Fenby, Jonathan (2010) The General: Charles de Gaulle and The France He Saved. Simon and Schuster. ISBN 978-1-84737-392-2. ^ Dallas, Gregor. 1945: The War That Never Ended. New Haven, Conn.: Yale University Press. 2005: 90. ISBN 0-300-10980-6. ^ 李涛. 终极刺杀. 中国友谊出版公司. 2009. ISBN 9787505725539. ^ 1914-1924年：接受战火的洗礼. 戴高乐基金会. [2013-10-14]. （原始内容存档于2013-06-21）. ^ 13.0 13.1 張懷德. 被歐洲放棄的台灣. 財團法人台灣大地文教基金會. 八十年代週刊. 1986-01-11 （中文（台灣）‎）. Ledwidge, Bernard. De Gaulle. London, England: Weidenfeld and Nicolson. 1982. ISBN 0-297-77952-4. 查尔斯·威廉斯. 二十世纪军政巨人百传：戴高乐传. 由孙洪兵翻译 . 时代文艺出版社. 2003: 4. ISBN 9787538716290.